God, I don’t like to wait on you. Too often, I prefer my own ways to yours and either stay stuck in darkness or afraid to consider new life because I can’t fathom turning things over to you. Help me to let go and let you lead and guide, and through my own cross, may I too find my empty tomb. Amen. Many women were also there, looking on from a distance; they had followed Jesus from Galilee and had provided for him. Among them were Mary Magdalene, and Mary the mother of James and Joseph, and the mother of the sons of Zebedee. When it was evening, there came a rich man from Arimathea, named Joseph, who was also a disciple of Jesus. He went to Pilate and asked for the body of Jesus; then Pilate ordered it to be given to him. So Joseph took the body and wrapped it in a clean linen cloth and laid it in his own new tomb, which he had hewn in the rock. He then rolled a great stone to the door of the tomb and went away. Mary Magdalene and the other Mary were there, sitting opposite the tomb. The next day, that is, after the day of Preparation, the chief priests and the Pharisees gathered before Pilate and said, Sir, we remember what that impostor said while he was still alive, “After three days I will rise again.” Therefore command the tomb to be made secure until the third day; otherwise his disciples may go and steal him away, and tell the people, “He has been raised from the dead,” and the last deception would be worse than the first.” Pilate said to them, You have a guard of soldiers; go, make it as secure as you can. So they went with the guard and made the tomb secure by sealing the stone. Dan was an amazing boy. He had one of those mischievous smiles that made you anxious and happy at the same time. You know the type, the one that says, I love you, and, I’m up to something, all at the same time. In everything he did, he was the incarnation of Dennis the Menace before your eyes, and despite all the craziness, you knew that deep within him was something so holy, so beautiful, that God’s very self laughed in each expression upon Dan’s face. At the amazing age of eleven, Dan knew himself, and because he was so very in touch with his soul, he had perfected the ability to make everyone around him feel good. He didn’t give others an empty happiness, but a full and abundant sense of joy, the kind C. S. Lewis expressed, that emotion of reality that celebrates among the difficulties of life. Counselors and children alike loved Dan. At the camp where I met him, he was a kind of legend. Everyone thought of him as a kind of hero. From the cooks in the kitchen to the maintenance man, every person in the camp loved Dan. He was a part of their lives and each person would have done anything in the world for him. You couldn’t help but feel that way about Dan. New campers were introduced to him, and amazingly, he never forgot a name. From the six-year-olds to the teenagers, Dan knew them all. And in his laughter, his constant smile, his frequent pranks that never devalued another, everyone knew him. He was the camp itself for many people, I believe. They came to see him, not to do the crafts and swim. No, they came because Dan cared and helped each laugh at him- or herself. Yes, Dan was an amazing boy. Dan had been born with a genetic disorder that affected the muscles in his legs, he had absolutely no movement in them. Dan had never walked, run, or even crawled. His whole life had been spent coping with the undeniable reality of weakness below the waist, and compensating with an unbelievably strong upper body. At the age of eleven, Dan sat, never setting foot upon the earth under his wheelchair. But never once, never throughout the long and hot summer camp, did the wheelchair or lack of leg muscles stop him. He played sports, maneuvering his chair down the court and shooting from three-point range. And he strapped on a life vest and got in the water, swimming to his heart’s desire. His amazing upper body strength could propel him through the water or enable him to wheel up and down a court. Some days he even had counselors place him upon the blob, a huge inflatable balloon-type thing in the middle of the lake. Sitting there, eagerly awaiting a counselor jumping onto the other end, Dan looked like the happiest human being in the world. And when the counselor hit the blob and propelled Dan into the air, a smile appeared on Dan’s face, a smile so wide all could see. In seeing their hero thrust high into the air, the whole camp would light up, smiles all over. Sometimes, even the cooks would come out to see. But we all wondered what Dan would do the day his cabin went on the high ropes course. This particular summer, Dan was now old enough to go with his cabin for the high ropes. In previous years, counselors had figured out ways to incorporate Dan into low ropes and the exercises they entailed. Everyone always talked about how Dan did so well, and how his perseverance helped them to build a true community along the course. But the high ropes were a different matter. Counselors were ready to help, but most of us couldn’t figure out how Dan would accomplish some of the elements. We knew he would be disappointed, not able to join the others, just sitting in his chair watching. Dan never like the sidelines nor accepted them easily. He was a fighter and always seemed to come out on top. So we were amazed when he announced he was ready at the zip line. Several people tried to talk him out of it, but Dan wasn’t listening. Helmet upon his head, harness around his waist, the rope of the belay ready to go; we suspected that the counselors would have to hoist him up the pole. Be was belayed and could have easily been pulled up the stripped tree. Instead, Dan took each of the spikes nailed into the tree, and pulled himself mightily, his biceps and back muscles doing an incredible amount of work as we watched in disbelief. Dan ascended, going higher and higher, making it to the platform some forty feet above us. 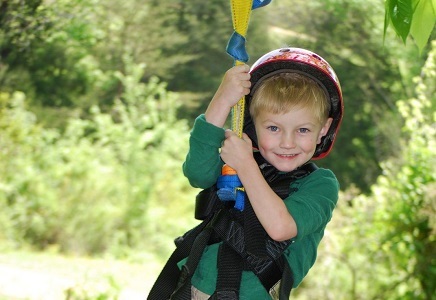 This amazing child of God, who had never walked, had pulled himself up the tree and was ready to fly on the zip line. And at once, just as we all expected him to zip forth in new life, he froze. Dan had had no difficulty climbing the pole; he had faced the hardship head on, and he had amazed every one of us. He had accepted his Good Friday. He had borne his cross, the cross of his whole life, and reaching the pinnacle, the opportunity to take flight, he stopped. He was now sitting on the cusp of something new, something incredible, and all he wanted to do was wait. Wait. To sit and wait. We all thought he had made it and now didn’t know what to do. And so the cheering started almost immediately. Come on down, Dan! some people were shouting. You can do it; we know you can, another cried. But Dan did not respond. He just sat there in total silence. He was looking straight ahead, straight down the line. And after thirty minutes or so, some of us started wondering if Dan would ever come down on his own. He had climbed in wild abandon. He had made it to the top, the hardest part, we thought. Little did we know how very much he needed the time to just sit there on top of the world, ready to fly, but waiting. Dan had always lived on Good Friday. He had borne his cross his whole life, and unlike so many of us, Dan had faced the crucifixion head on. He had not denied the difficulties but had accepted them, living one day at a time with the cross life had dealt. But in retrospect, not a one of us had seen his true suffering. He had merely been a hero to us, someone who had made the most of life and had pushed us to see how lucky we were. But in our shallow pity for Dan, we had failed to see his real life. When we saw him stuck there on the platform, we saw his true soul longing to leave his cross behind, longing to be on the cusp of resurrection, longing to let Holy Saturday be his final part of the journey toward new life and light. Holy Saturday is not a big day in most churches. In fact, few parishes even have a Holy Saturday liturgy these days. It only lasts about ten minutes. A prayer or two, a short scripture reading, maybe a homily. Why go and mark the day when nothing happened? Why mark the day when Christ was merely in the tomb, stuck between Good Friday and Easter morn? Because the greatest promise of light comes in the darkest hour. Dan understood that being in the world means some crosses never really go away. Instead, they are borne as a part of life itself. But Dan also showed us how wonderful it can be to sit, stuck between Good Friday and Easter morning. When we see a glimpse of resurrection coming in our own lives, when we see the possiblity of the cross being removed, we savor it. We sit in silence. We behold the possibility of all that comes in letting go and letting God. Too often, even those of us who make our way to the Good Fridays of life skip immediately to the Easter parade, the party with the lamb, the wine, and the chocolates. We want to escape the waiting time because sometimes that means accepting the cross of our lives for what it is and likewise accepting that Easter may not bring what we want. We jump to the happy morn because we don’t want to deal with the waiting, the in-between time where so many of us live our lives. We’re too scared to move from the tomb and wait on the platform, too scared Easter might not be what we expected. How do we move from a life where there are still unexplained accidents, shootings, diseases, disappointments, and struggles to arrive on the platform, the zip line dangling above our heads? By letting go. It’s really that simple. Deep within each of us we know our own Good Fridays, we know the things that hurt and claim our souls. We know the things that make us pause, and sit, wondering what it will be like to move from a place we know too well. Knowing these things, we must let go and with God patiently wait on the Holy Saturdays of life. It’s there in that place where the line becomes clear and the possibility of resurrection hope becomes real. When we skip from the hardness of Good Friday directly to Easter, we miss the waiting time. We miss the letting go. You can let your heart be free in the silence of Saturday. By just sitting there in the tomb of your life, Christ can begin to move within you. By accepting the stillness, by letting the darkness invade, you allow the darkest hour to become the greatest hope. And in that moment, the broken “Alleluia” sings deep within your soul as you find its truest song. And with wild abandon, in the midst of the screaming silence, you will reach up and with Dan find the zip line. In letting go and letting God, you will accept the cross, accept the silence, and enter into a new Easter joy. 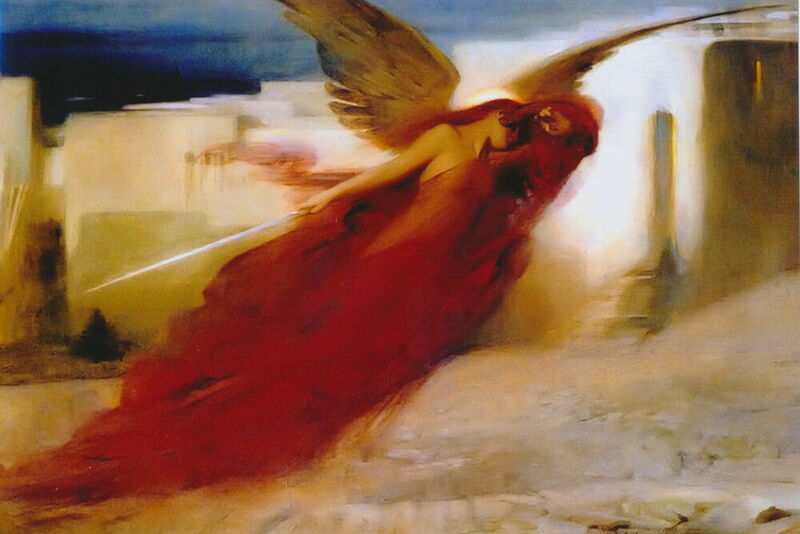 You will encounter the resurrection just before dawn, and with the wind in your hair, the ground blurring under your feet, you will zip into the dawning light of a new day. In this last chapter you created your cross by revisiting all the exercises used in this book. All the things that claim your life and pull you down were placed upon the cross for God to transform. We heard Jesus proclaim, It is finished, as the sun set on our Good Friday. We now come to the last part of our journey as we wait with God for new life. We let go, let God, and find the ability to glimpse Easter light breaking in upon us in the darkness of the night on Holy Saturday. We prepare for our resurrection with God. The cross you created in the last exercise. Markers, colored pencils, or pastels. If you’ve faithfully engaged the exercises, you’ve embarked upon a time of self-discovery in God that makes your humanity more of a gift than a burden. By giving yourself over to the narrative of God’s grace, your cross has begun the transformation of moving from darkness into light. You’ve found areas in your life where light is shining brightly and the love of God is manifest. You’ve found what it means to be a human being, created in the image and likeness of God, and in that you’ve let go of judgment to encounter a new level of consciousness or mindfulness in God. You’ve also likely found areas that need more love and mercy if you’re to let go and trust God enough to plumb their depths. This exercise allows you to claim each of those areas through the gift of color. You took time in the last chapter to reflect upon the cross you created. Now, you take that reflection deeper. Ask yourself which areas are basking in the light, which are coming toward the light, and which are still stuck in the darkness. Take the plunge and get honest with yourself and God about the work left to do. As you reflect upon these questions, select colors that portray where you think you are on the journey. Are there some areas of golden sun, things that have basked in the fullness of God for a while? Are there things that sit in bright yellow, as if at noonday? Are some just seeing the light, breaking forth at dawn in shades of gold and orange? Are there some just before dawn, purplish-blue? Or some still stuck in midnight colors of black and blue? Try to identify these areas and use the pencils, markers, or pastels to portray where the various areas of your life are. Be creative. If using acrylics, smear the colors along edges to portray how the colors are never pure but instead emerging from each other. Let your creativity come fully to the page as you claim God’s light and life in your humanity, the center of your life becoming the heart of God. Which was easier to identify, the areas of brightness or the areas of darkness? Why? Do areas that bask in light already surprise you? Are there any that have changed because of this Lenten journey? What were you able to do that allowed the transformation? If there are areas of darkness, why do they linger? How might you see more promise in their darkness? Do you believe you are stuck on Good Friday or are you sitting on the promise of a new day as you encounter Holy Saturday? How can you incorporate the image of light into your everyday life? What steps do you need to take to make sure you continue plumbing the depths of who you are in Christ? Are there activities that need to be removed from your life if you’re to continue along the journey this discipline has brought to you? Are there things you need to add? Which exercises do you need to repeat often? Which ones didn’t work well for you? How can Easter light become a part of all that you do? Of all that you are?